This histamine-lowering quercetin rich juice appears in the Anti-Cookbook: High Nutrient Antihistamine & Anti-inflammatory Recipes for Health. You know how you take antihistamines for allergies? Well antihistamines are found in food too; especially in brightly coloured and leafy green ones (sorry, nope, not M&Ms). Having given up antihistamines last year, my focus has shifted to eating them! 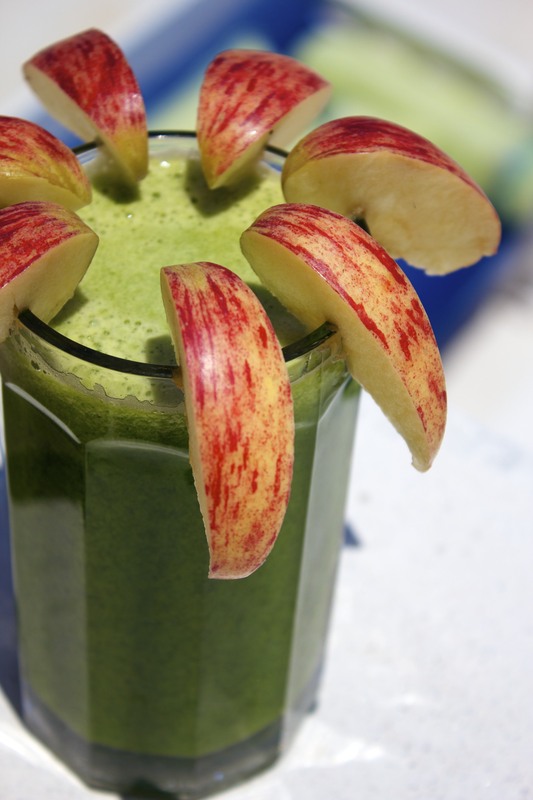 Apples are rich in histamine lowering quercetin and inhibit the development of allergies . Spirulina inhibits histamine release from mast cells and possess anti-inflammatory and cancer fighting properties . Particularly effective for allergic rhinitis  (also known as a stuffy nose!). Chlorella is an antihistamine that works by preventing mast cells from releasing histamine . Broccoli prevents cancer  and gastric mucosal damage . Cucumber meanwhile is a natural pain killer and an antioxidant. Worried about thinning hair? Cucumber also prevents the body from making the highly inflammatory molecule prostaglandin  which (as I’ve previously posted) has been implicated in hair loss . Juice the broccoli, cucumber, celery, apples and ginger. Spoon in the spirulina and chlorella, stir well and enjoy!